The government should consider strengthening the fining powers of the Solicitors Regulation Authority and lowering the burden of proof in cases that reach the Solicitors Disciplinary Tribunal as part of the reforms needed to combat insurance fraud, a major report has recommended. The Treasury-commissioned Insurance Fraud Taskforce also called on insurers to cut down on pre-medical offers and to defend cases where they believe the claim is fraudulent – rather than making a commercial decision to pay them off. “It is alleged that there are even some cases where law firms are set up by criminal gangs to assist them in their scams,” the report said. The taskforce – whose members were drawn from the insurance industry, the Financial Ombudsman Service, the Financial Services Consumer Panel and Citizens Advice – found that many stakeholders criticised the SRA, “saying it is not doing enough to take enforcement action against solicitors involved in fraud”. It said: “One issue that stakeholders, including solicitor members of the working group [which advised the taskforce specifically on personal injury fraud], commonly raised is that the SRA Handbook does not stipulate what checks claimant solicitors are required to carry out for their clients in PI cases. Another common criticism was that the SRA has not enforced the referral fee ban “as effectively as it could”. It urged to SRA to take a “tougher approach” on both of these issues. 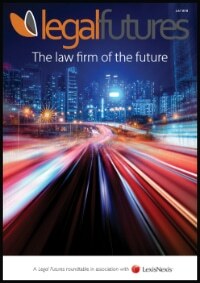 In turn, the SRA raised its longstanding argument about bringing its power to fine law firms and their staff without the need to send them to the SDT – currently capped at £2,000 – in line with its statutory power to fine alternative business structures £250m and individuals working within them £50m. The taskforce recommended that “the government should consider strengthening the fining powers of the SRA for fraudulent or corrupt activity”. It noted that while the SDT has unlimited fining powers, the tribunal considers cases on the basis of the criminal standard of proof. “That makes it difficult to impose high financial penalties and more importantly means that those who are dishonest on the balance of probabilities (the civil standard of proof) can continue to practise. This undermines the strength of the regulator, and means its enforcement actions may not act as a credible deterrent. This led to the recommendation that the government should consider reviewing the standard of proof at the SDT. The taskforce also called on the SRA to make greater use of its ‘naming and shaming’ powers. But equally it recognised the “difficult task” of the regulator in identifying the small minority of solicitors and firms operating a corrupt or fraudulent business model given the size of its regulated community. Another recommendation was that the claims notification form used to submit a case to the electronic claims portal should require solicitors to disclose details of the referral source. “Requiring firms to disclose referral sources would allow insurers to identify those from ‘claims farmers’ and other questionable sources and scrutinise the claims more closely and refer dishonest solicitors to the SRA,” it said. A further recommendation concerned frauds where solicitors act without genuine instructions in order to take forward a claim. “It is good practice for claimant representatives to notify defendants that they have received instructions from their client; however, several defendant representatives raised concerns that this does not always happen. “As a result some insurers and defendant solicitors contact claimants directly to ask them whether they have instructed legal representatives, despite being unsure about whether this is permitted. The taskforce recommended that the Association of British Insurers, in conjunction with the Insurance Fraud Bureau, should produce guidance to its members setting out what forms of direct contact is acceptable where they suspect that legal representatives are acting without instruction, and that claimant and defendant representatives – working with the SRA and bureau – should produce a standard letter for insurers to send to claimants directly to verify whether they have instructed a firm to represent them. On pre-medical offers, the taskforce said that while they could be viewed as “rational commercial decisions” when taken alone, “systematically settling claims in these ways can encourage the view that insurance fraud is ‘easy money’, undermining anti-fraud activity elsewhere in the organisation”. Given the creation of MedCo to make the medical evidence process more robust, it continued, “the taskforce considers there is a strong case for insurers to reduce the number of pre-medical offers”. The report said the insurance industry as a whole should consider following those insurers that defend all court proceedings where they suspect the claim is fraudulent. There should be a “legacy vehicle” established to ensure the taskforce’s recommendations are implemented.